Because I was sitting in my bedroom at a loss for something to write about this week, I reached out to the Twitterverse as an attempt to stir an idea. Thankfully, @PhillyB322 had a great suggestion for a starting point to kick things off. Wow. Huh. 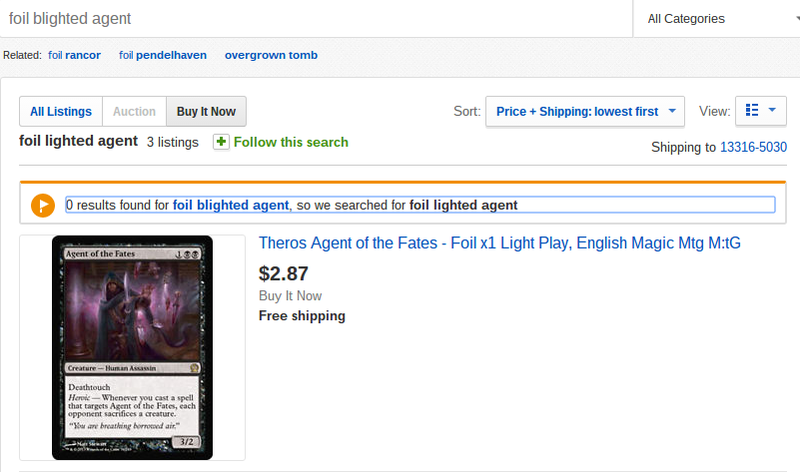 I literally cannot find a single foil Blighted Agent on the U.S. market. No beat up copies, nothing on eBay, ABU, CK… Wow. 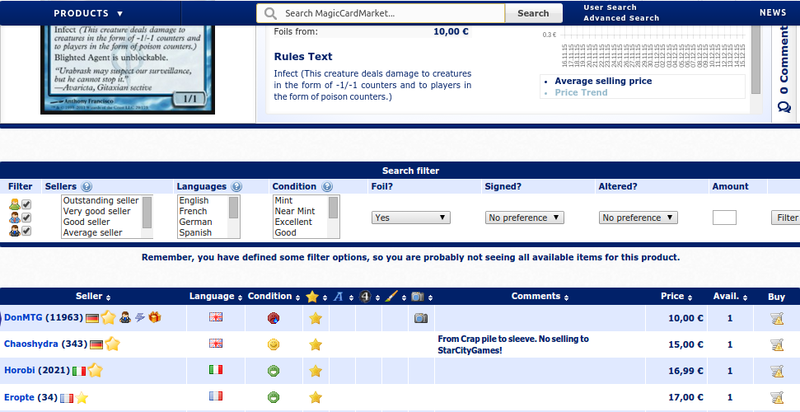 After some further research, I managed to find the European market stocked with a few copies, if you A) really need them for your own Infect deck or B) are convinced that these can jump to $25 or $30. So what’s the reasoning behind the vanishing act? It doesn’t look like someone bought out the entire internet recently with the intent to make a profit. If they did, I think we would have seen players and store owners coming out of the woodwork: digging their copies out of bulk, swapping them from decks, and listing them online to start a race to the bottom. 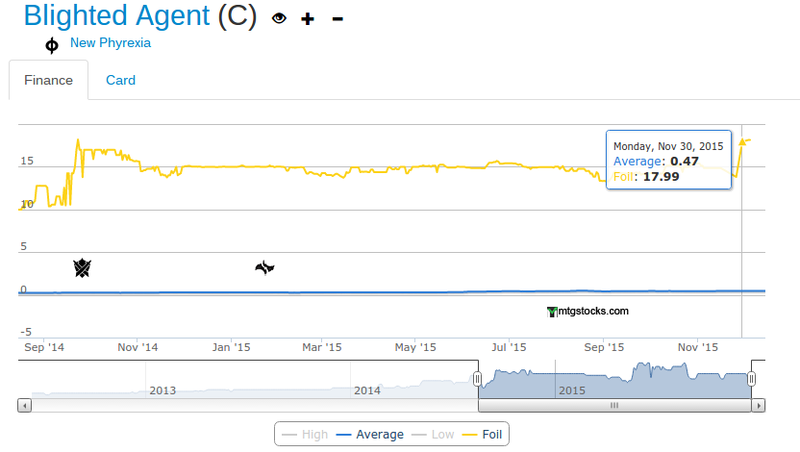 If we check the MTG Stocks foil graph, the only recent movement that the foil has shown is a slight bump from $14 to $18 in the past month or so. So what’s our battle plan with this information? Do we go narrow within the deck Blighted Agent sees play in, and pick up other foil Infect stuff? I can’t really think of anything else in the deck that has a similar multiplier that’s ready to jump. 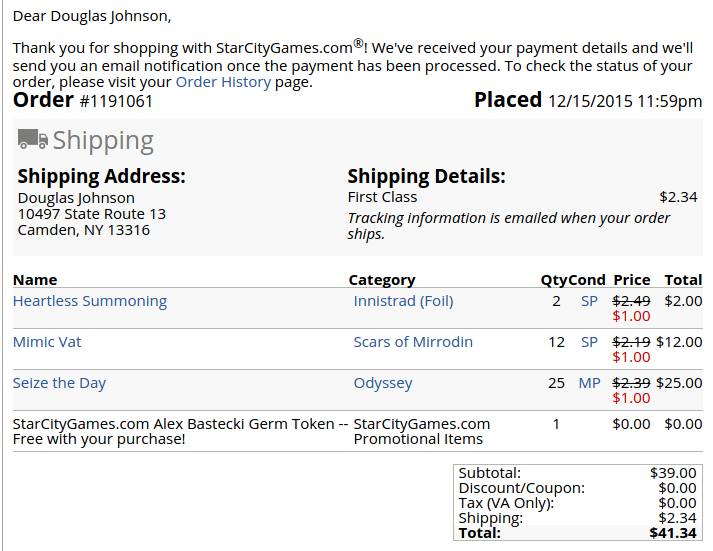 We missed the boat on Groundswell foils (well, I did; I sold mine on TCGplayer for around $4 if I remember correctly. 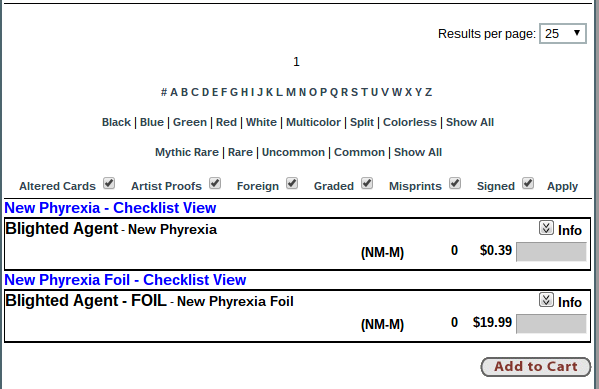 You might have made a bunch of money buying my copies, and would be laughing at me right now), while the non-foil continued to be pressured into the ground by the reprint that it received in Duel Decks: Zendikar vs. Eldrazi. 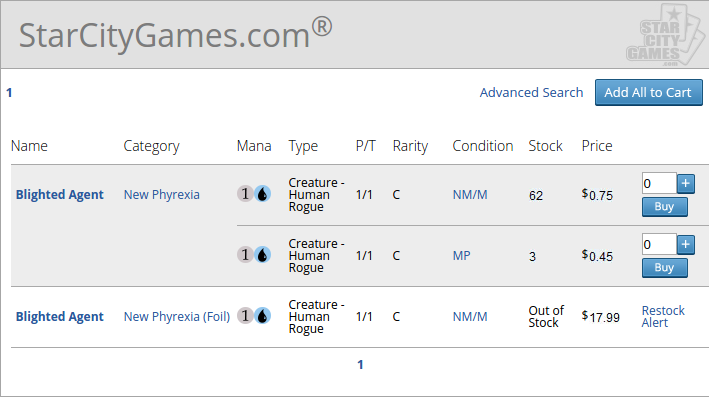 Some of you know that I’ve been on the Glistener Elf train for a while; I still firmly believe that holding non-foils of Elf and Agent are the correct play (buylisting them at $.10 and $.25 seems criminal while Deceiver Exarch is chillin’ like a villain at $3.50, even with the aid of a reprint in the Commander 2013 set. If you have the privilege of picking NPH bulk, I’d hesitate on shipping those Modern common/uncommon pieces, at least until the end of winter. 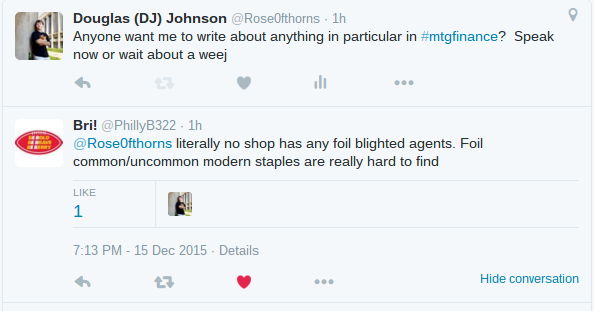 Alternatively, we could jump over to other Modern decks with commons and uncommons with foil multipliers that appear to be criminally low. You’d be surprised at how little Modern play a card needs to see to be worth money: my friend Izzet Staticaster from back in my Kiki-Pod days is now a $10 to $12 foil, even though it basically only sees play as a one-of in the Grixis Control and Grixis Twin lists. Is this also a common Cube card that I’m not aware of? 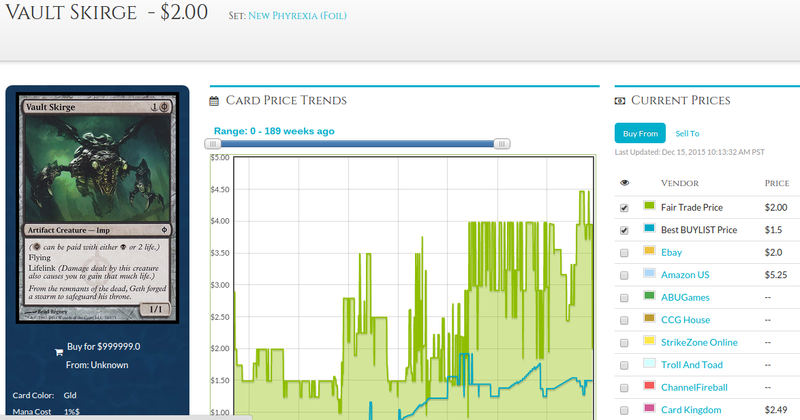 It’s from a more recent set than the Infect twins, sees less play, and yet the foil has still been holding its own at the post-spike price for about a month now. While he does have a Gateway promo from back in the yonder days, I’m definitely surprised to see this little flier so cheap. Is this the next Izzet Staticaster? It certainly sees enough play as a consistent four-of in Affinity, ruining the lives of mono-red players everywhere. It’s hard to reprint again with that good, ol’ Phyrexian mana, and you can pick up a playset of either version for around $10. While I’m not one to normally speculate on cards at full retail, I definitely like Vault Skirge foils going forward into Modern season. Is there anything else from Affinity that we can look to in the relatively under-appreciated commons and uncommons? While most of them have been reprinted into dust, the pack foil of Signal Pest has been lagging behind its promo version. Whether that’s simply due to an art preference is open to debate, but if you’re looking to foil out an Affinity deck, I would start with these two aggressive and cheap (in both senses of the word) one-drops. 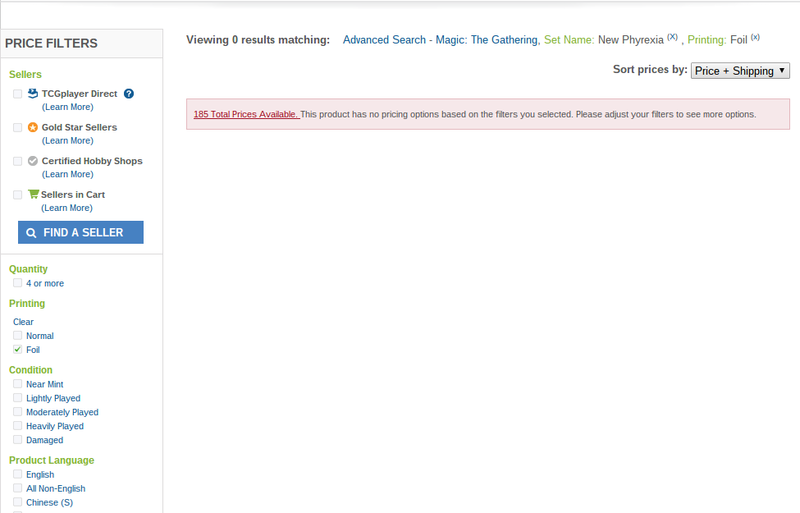 Unfortunately, a lot of the cards that I was originally going to buy didn’t make it to the end of the checkout process. I was going to get away with 43 SP copies of Boundless Realms at $1 each, but someone else sniped them before I could finish my purchase. The same goes for those other 10 copies of Heartless Summoning, and about 15 more Mimic Vats. The Seize the Day are for an arbitrage attempt, so we’ll see how that goes. My experience with SCG’s grading has been extremely positive, and most of the SP cards that I’ve ordered from them have been NM by my and my customers’ standards. I’m hoping that MP will basically be my SP, so that I can still make a few dollars by just shipping out most of those Seizes to another store, even after the dust is settled with grading. As a closing statement, I’d like to remind you to check out as soon as possible when you find a great deal like those Boundless Realms that I missed out on. I got greedy by putting them in my cart, and scanning through the rest of the $1 sale to see if I wanted to add anything else to my cart beforehand. If I had locked in that order of 43 Boundless Realms first, it would have been well worth paying the shipping costs for separate orders by making sure nobody else could snipe them out from under me. Misplays were made, and lessons learned! Might want to censor out your mailing address from the SCG screen shot. I’m not worried about it. If someone wants to send me spam because they hate my articles so much, I consider that an accomplishment. Staticaster has a high multiplier because it is a common and powerful sideboard card in Legacy Miracles. It sees more play there than in Modren. TIL. I don’t watch too much Legacy. I picked most of those foils up either at the beginning of its Standard life or at rotation, as those are usually the low water marks. It’s never a huge investment, and it’s always nice when you look in your foil binder later on and can trade that foil Might of Old Krosa and get a foil Newlamog! Definitely agree. A lot of people were suggesting we’d get Rishadan Port as an expedition, without thinking that Rishadia is an actual city on Mercadia, not Zendikar. 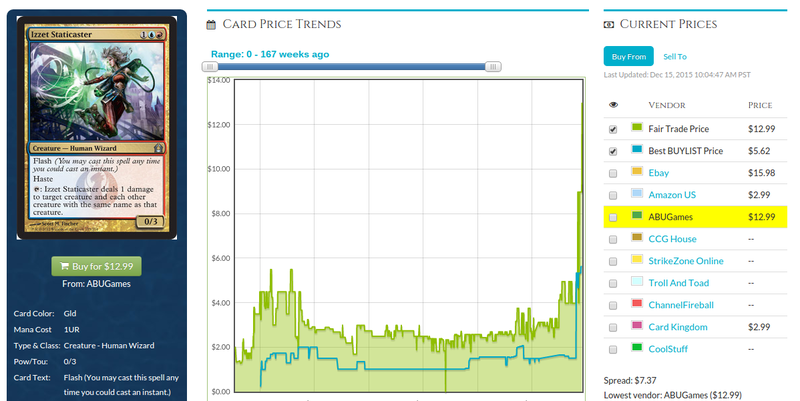 If the LGS has a Blighted Agent at $17.50, would that be a good pickup? Do we see it going much higher than this?